*To be honest, I omitted some of the ingredients for calorie purposes. Of course, the taste won’t be the same, but I cut out the bacon and the cheese. I used Sara Lee 100%Whole Wheat bread and a Sunny Meadow egg, which made this breakfast sandwich come to a total of 235cals and 13g of protein. It was still good minus the bacon and cheese, but one dayI will add the extra ingredients to get the full taste! PREHEAT oven to 400°F. Cut hole in center 1 of the bread slices, using 1-1/2-inch cookie cutter or rim of drinking glass. Discard removed bread circles or reserve for another use. SPREAD remaining bread slice with margarine. Place, margarine-sides down, in 13×9-inch baking dish; sprinkle with half of the cheese. Top with cut-out bread slices to make 1 sandwich. 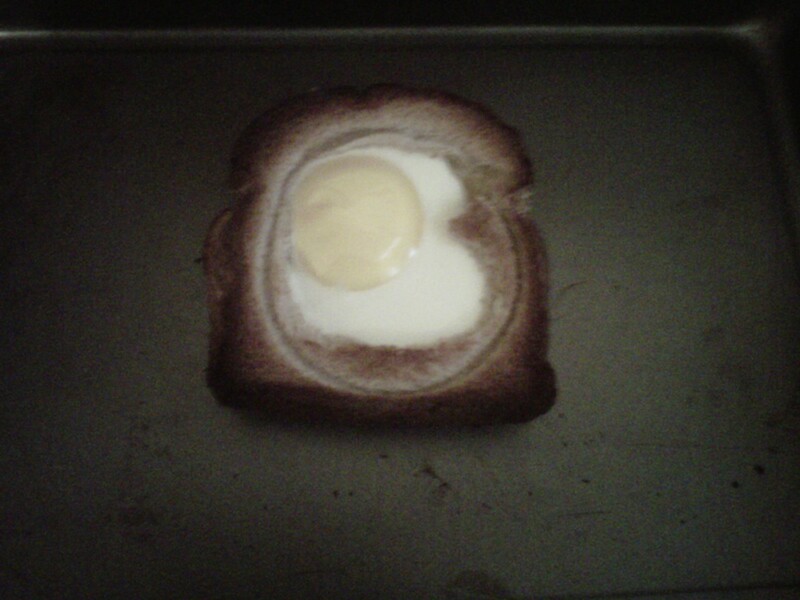 Break 1 egg into the hole. Sprinkle with remaining cheese and the bacon.